Robert M. Myers continues by discussing evangelism. It is very difficult for some to witness to others. However, by allowing the Spirit to guide then direct witnessing comes much easier. There are three stages of witnessing: icebreaker, wilderness, and sharing the Kingdom. The icebreaker stage is perhaps the hardest for it is finding a way to make a connection to the other person whom you may never have met. The wilderness is entering the place of the other person's hurt and pain. It is unknown territory and should be the listening stage. The sharing stage is when the Spirit provides you with the direction and wisdom to share the way out of the wilderness. Robert M. Myers backs his text with scripture references. 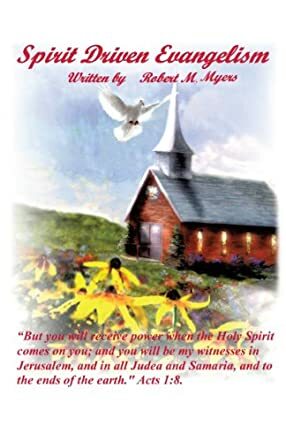 Spirit Driven Evangelism is a small book with a mere 98 pages, but it is a powerful book and can certainly be an invaluable tool for ministry. This review has only touched on the highlights of the text. There is a sample prayer and suggestions for guiding a new Christian. I highly recommend this book for all church leaders and all willing or called to Evangelism.